SEO improves the visibility of your website in search engines. When a person searches the internet, search engines find the most relevant content and display the ranked results. 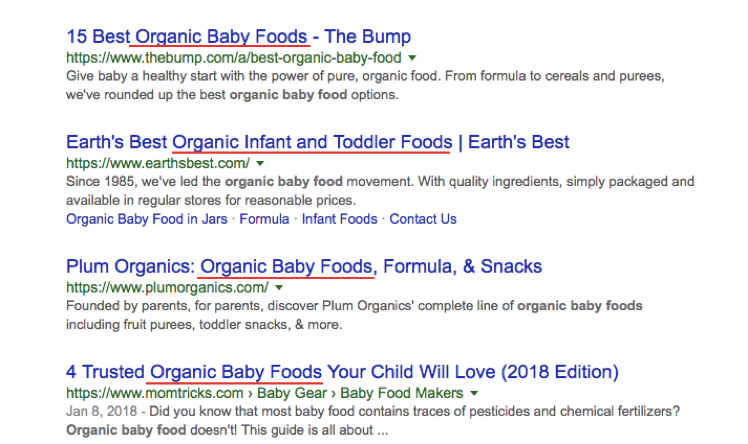 These sites have the keyword in the title (the blue text) and in the page text, so Google identifies the pages as highly relevant. Create a user-friendly, error free, and well organized website. Search engines avoid ranking faulty, slow loading websites. At the end of the day, Google and Bing rank websites that will provide the best user experience for their customers. Optimize your mobile site for SEO. Google recently switched to mobile-first indexing, where their bots analyze mobile sites to rank pages for content. 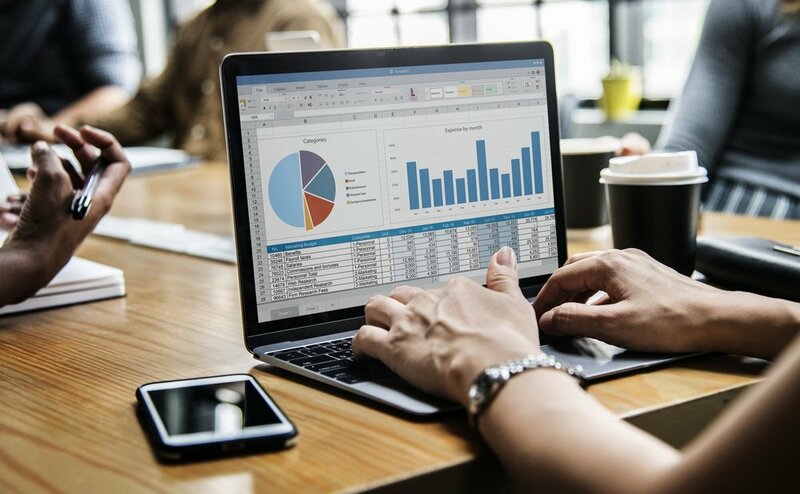 By targeting relevant keywords with content and optimizing your pages, SEO increases the number of organic visitors on your website - customers that find your site directly through the search engine. Good keywords have three things. High relevance to your topic. 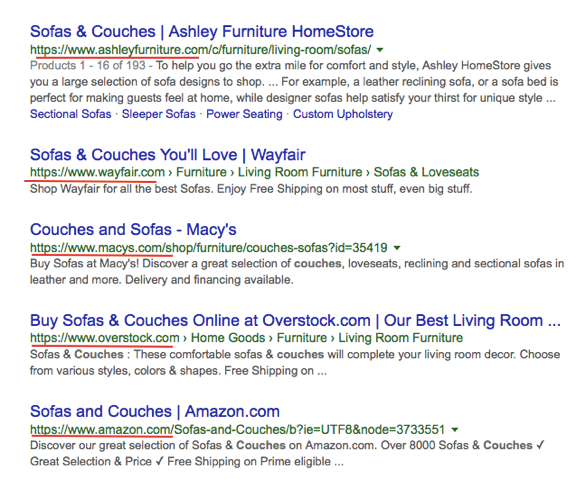 If your store sells furniture - chairs, beds, and couches aren’t good keywords on their own. Successful SEO campaigns use relevant long-tailed keywords like Atlanta Reclaimed Wood Dining Chairs or Vegan Leather Couches & Sofas Richmond. These keywords are specific enough that the content will not have to compete with bigger companies and will attract relevant users. Content marketing involves the creation of online content like blogs, videos, infographics. This content should be helpful to the user, not a distinct branded advertisement. Stimulate interest in the products or services you provide by creating relevant content. Suppose your business sells luxury pet supplies. Users arrive at your website mostly by searching your business name. Sometimes they arrive through searching “pet supplies”, “luxury pet supplies” or some variation of similar keywords that you have on your product pages. Content marketing expands your keyword reach. Create pages, blog posts, and videos about the things your potential customers might be searching. For example, people searching “pet spas & suites” seem interested in the health and well-being of their pet. They are probably interested in purchasing luxury pet supplies. Creating a blog post with a title like “The Top 20 Pet Spas & Suites in the US” would target those potential clientele. The more relevant keywords you target, the greater your company’s visibility in search engines. Social media marketing is the targeted use of social media platforms and websites to promote a product or service. In 2014, time spent on mobile apps averaged over 3 hours per day in the US, beating TV viewing time by half an hour. Mobile advertising is currently a $33 billion dollar industry. Social media marketing includes creating targeted content and sharing it across different platforms. It also involves creating ads that target your specific audience. For the best results, target the social media sites your customers frequent. Improve brand recognition with a targeted social media campaign. Cultivating a dedicated consumer base through posts will increase the brand value. Respond to questions on your social media account and interact with other companies’ posts frequently. Social media advertising is cost effective. Post about upcoming promotions and sales and share content you’ve created on your website. 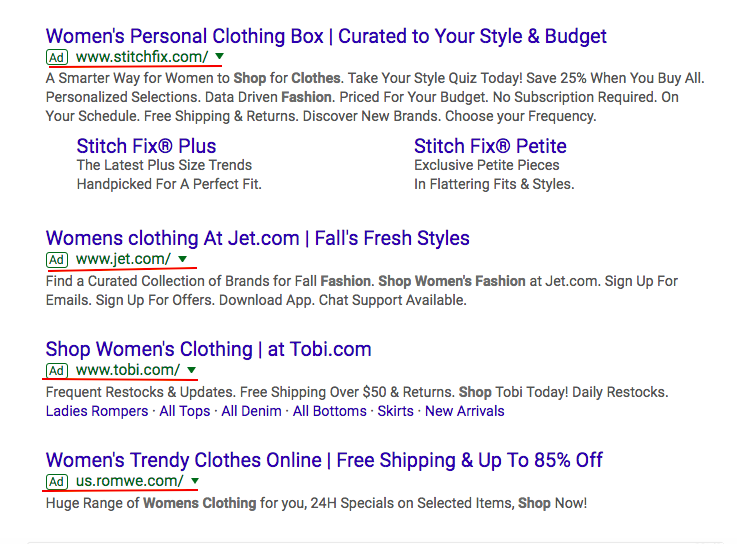 These are pay-per-click ads, which function how their name suggests - companies pay for each click. Within Google or Bing Ads, select keywords that are highly relevant to your services (e.g. Luxury Pet Supplies, Dog Beds, etc.). Your position for that keyword depends on your AdRank. AdRank is a function of your CPC bid - the amount you are willing to spend per click - and your Quality Score - which comes from your landing page quality, relevance, and projected click through rate. Pay per click campaigns can be difficult to manage effectively, but are extremely rewarding. Track your progress with conversion and income metrics. Some social media advertisements on Facebook and Instagram also work via pay-per-click. People send and receive billions of emails every day. Email marketing delivers your advertisements directly into interested consumers’ inboxes at a low price. To acquire email contacts, offer incentive to join your emailing list. This could be a subscription discount like 10% off their first purchase. Promising exclusive offers and sale notifications is compelling incentive. If a user is interested in your products, they will appreciate the notice of specials and sales. Engaging, useful, and informative content convinces interested users to join your email list. Some sites will offer a step-by-step guide to running a marketing campaign, outlining a paper, or cooking healthy meals. Some will send out weekly fitness tips or news updates. If a potential customer has reached your site, you don’t want to lose them! Email marketing is an effective way to maintain consumer engagement, even after they’ve left the site. Once you have a large subscription base, divide contacts into different groups based on factors like geography, purchase history, or interests. Target those groups with focused content to maximize return of investment (ROI). Influencer and affiliate marketing draw on the visibility of other individuals or businesses to sell your products and services. Influencers are often social media presences, whereas affiliates are blogs and other places where your products are sold. To start an influencer marketing campaign for luxury pet supplies, search Instagram hashtags related to pets. Find an avid pet Instagrammer (or maybe a few) with many followers and high user engagement on their posts (many likes and comments). Then, hire them to use your pet products in their posts, link to your products, and raise brand awareness. Measure the effectiveness of this campaign by providing the influencers with a unique promo code for their followers to use when purchasing. Using an affiliate or influencer is like hiring a salesperson. They brainstorm creative ways to sell your products and increase brand visibility. Video marketing has grown tremendously in the last few years. In one marketing study, 50% of consumers indicated they prefer videos more than other types of advertising. Making videos is easy. Smartphone cameras rival expensive cameras for video quality - many even take 4K videos. Create inexpensive videos using your phone or an easy animated advertisement tool. Find a video type that suits your products and services. If you sell a product with a visible result, release a demo video. There are many types of marketing videos - expert videos, educational videos, testimonial videos, live videos. Studies have found that including videos on your landing page can increases conversions by 80%. Create relevant, compelling videos that engage users and improve company visibility. Older PostWhy is User Experience Important?